It’s virtually impossible to mention the Ford GT, or its predecessor, the Ford GT40, without mentioning the monumental achievement that is Le Mans. The original GT40 racer was thrown down as a gauntlet against Ferrari. This new Ford GT race car is being thrown down as an in-your-face challenge to the entire world. The new 2016 Ford GT, from its flying buttresses to its buzzy exhaust from its twin-turbo V6, was always meant to hit the track. And specifically, it was meant to hit the track on the Circuit de la Sarthe, like all proper Ford race cars do. Unlike the original GT40 however, there’s not just one target in the company’s sights now. Sure, Ford’s eyes are always on the prize of victory, but the list of serious contenders running nowadays is deep. Not only are there Ferraris to deal with, but Corvettes, Porsches, and Aston Martins all present real threats. And unlike the original car bearing the “Ford GT” moniker, this is a completely serious racing effort. Ford GTs developed by a Swiss firm raced as GT1 cars at Le Mans in 2010, and another example as a GT2 car in 2011, but those never came up with much. 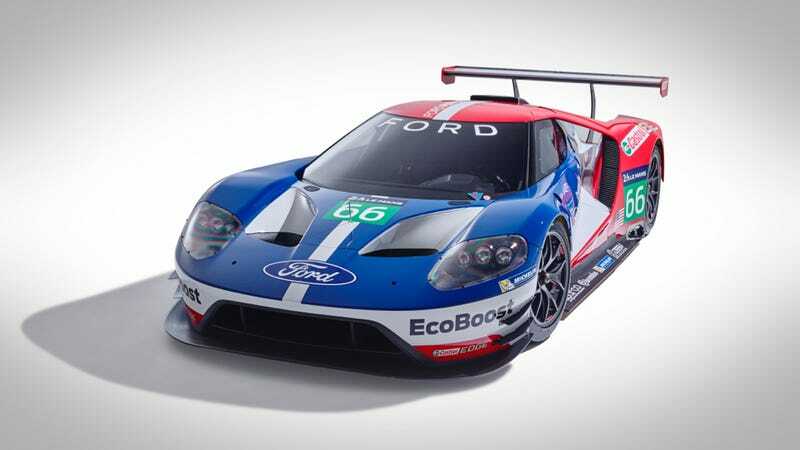 So for the first time in a long time, this is real, this is determined, and, perhaps most importantly, this Ford GT racer is factory-backed. Developed in conjunction with Chip Ganassi Racing (who have won a whole bunch of races, but never at Le Mans) it’ll run the full 2016 schedules of the FIA World Endurance Championship and TUDOR United SportsCar Championship. And it’ll make its debut in January, at the 2016 24 Hours at Daytona. But holy crap, CHECK OUT THAT DIFFUSER. This car is right about 97% diffuser, and it is amazing. There aren’t any details yet about how truly fast it is, or who the drivers will be, or why no one has delivered an example right into my garage just yet, but with its red-white-and-blue scheme we can at least promise it’ll be another orgiastic American beast, ready to take on the world.